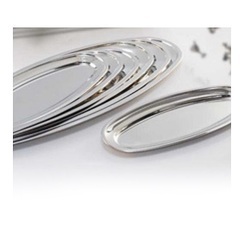 We are offering Hammered Round Serving Plate to our clients. We can provide customize Aluminum dish platter. Relish Indian cuisine in Indian style! 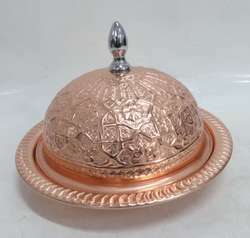 This is a set of centerpiece serve-ware for Indian food. Serve Indian dishes to your friends and family in this unique and ethnic looking centerpiece serve ware. With this serving utensil set your Indian style dining experience goes several notches up. The material used is food grade. The material ensures that it is long lasting and sturdy. Compactly designed you can keep this on the table or kitchen shelf. We are well recognized organization to offer an extensive array of Natural Slate Tabletop Accessories in the market. Our designers manufacture this array with the help of newest technology and modern skills. Moreover, this range is highly demanded for its real design and nominal rates. - Usage: For keeping salad. Under the supervision of our experienced professionals, we are providing high quality range of Wooden Serving Platter.